NeighborGoods launched recently, and in their own words, “NeighborGoods.net is a safe online sharing community where you can save money and resources by sharing stuff with your neighbors.” I like that idea… It’s one of those things that’s made easier by using the Internet. I mean, sure you could get to know all of your neighbors, and make lists of what they have, and what you have, and do it all offline, but who’s going to do that? Web site to the rescue! I don’t have a huge inventory yet, but I’ve listed a few things I have, that I do not use very often. A ladder, a heat gun, an old wagon… Nothing of great value, but useful if you need it. I borrowed a ladder from Neighbor Micki (Micki Krimmel’s admin account) to see how it all worked, and it works fine. In theory… and then in no time, I had a request to borrow something! So, about the wagon… I made arrangements for the person to pick up the wagon, and replied on the site with the information. I ended up having to leave the wagon outside since I couldn’t be home when the person was coming to get it. Because of that, I asked for a phone number and email address. I never got them. I then had a change of plans, and I was going to be home for the pickup, but two days passed without them coming to pick up the wagon. Finally I heard back from the person. She apologized for not making the pickup, and provided an email address and phone number for her husband, as she was busy at a conference all day. 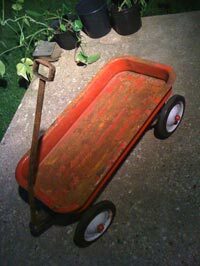 Then I got super-busy, and couldn’t get in touch until the next day… It was either too early or too late (by my standards) to make a phone call to someone I didn’t know, so I emailed, letting him know I would put the wagon outside by our garage. I never got a response. After that, I never heard back… not from the woman via the web site, nor from her husband via email. I also provided my phone number with my very first communication, so I don’t think I was inaccessible at all. There was really only one time where I didn’t reply within the same day. I’m not sure… I mean, maybe they just got super busy and never got a chance to come get the wagon. (Though they never said that, or canceled the transaction, and during the 11 days, it always seemed as if they were coming to get it.) If it had been a smaller item, I would have considered taking it to work, which is closer to Milwaukee, and said “come any day between 8am and 7pm, and I’ll be here to hand it to you.” Maybe they saw the photo of a rusty wagon and decided not to use it. Maybe they found someone else closer with a stroller or better wagon. Maybe it was all a scam. I really doubt it was a scam… if it was, it’s the worse “I’m gonna steal your old rusty wagon” scam I’ve ever been involved in. In all seriousness though, I do look forward to my first real transaction on NeighborGoods. Update: Oh, one last thing… I ended up canceling the transaction on the day it was to end (as the transaction never too place, and I didn’t want the system to think it did.) After canceling, the thread of messages disappeared! I could still see the messages sent to me in the Notices section of the Inbox, but not the messages I sent. If the messages I sent really are inaccessible, I’d consider this data loss, and a major bug, as I think it would be valuable to have record of all transactions, even if they fail. Posted on Wednesday, August 4th, 2010 at 12:00 pm. Subscribe to the comments feed. Both comments and pings are currently closed. Post on your own blog. Hey there, Raster! Thanks so much for trying out NeighborGoods and for posting your experience here! It’s really helpful to see the details of a transaction and where the friction is. This gives me some ideas we can implement to make it a little smoother. And yeah, you’re right. We should display the conversations on canceled transactions. We’ll fix that!